OK, I have a confession! I screwed up royally! Basically in a nut shell…………I didn’t check the battery strength of the Trail Cameras battery’s before I put it out! I assumed that they would be good? There are 6 D size batteries in that thing and I underestimated the power draw. I had used it a week before on a another Dead Sea Lion. I checked those shots it took with the same battery’s and more than half of them were shot at night . That would mean the flash would of been firing, and thus draining the power more! I had the camera out over top of this Sea Lion for almost 2 weeks! After reviewing the shots. I have come to the embarrassing fact that the Trail camera only took pictures on the day I dropped it off! When it got dark and the flash had to be used,it failed and didn’t have enough power to do anything at all! It just sat there doing nothing! I missed alot of great shots! I also noticed another problem! The motion detector is too sensitive and it cannot be adjusted! After I deployed the camera,it took 169 shots before it failed later that evening. The vast majority of these shots were of ” water lapping onto the shore”! The water looked calm enough to me but the sensor is way too sensitive and they should of built into the unit a dial to adjust the sensitivity! Every house has a outside motion detector on their lights. They have a small dial on those so that the sensitivity can be controlled. I see no reason why they can’t have them on trail cameras? At any rate……..I’ll be more careful in the future! I’m looking into making my own unit. Something with better resolution too! These units have a very small sensor and produce “grainy” images! Poor quality but they were not designed for that. They were designed for recon only! Hunters use them to see whats prowling around? 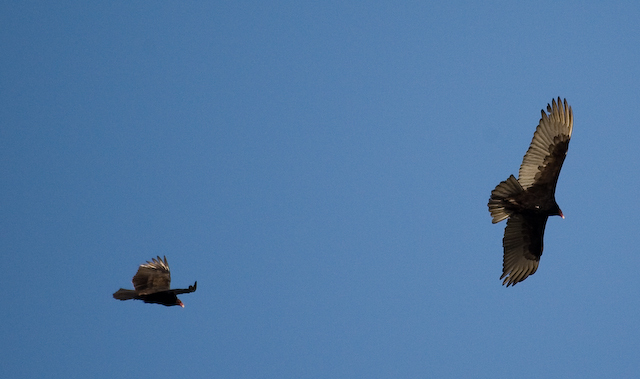 I did get some wolf shots and a few of those two Turkey Vultures. It wasn’t a total loss,but more importantly I learned something very important! Dead Sea Lion Going,Going………….Almost Gone! I included a few shots of the Sea Lion when I first found it . It shows a great transition period! They couldn’t get at the carcass and were content with soaring on some thermals until they too could chow down! I heard about a second dead Sea Lion and went to the reported spot! When I came around the corner,I was going slow so as to not make as much noise. Sure enough,there it was and it was a big boy! That first Sea Lion was a quarter the size of this guy! The locals will be dining on it for awhile! The only problem I have is putting the trail camera up? Because of the location and the size of the beast,I am forced to hammer a metal post into the beach and strap the camera to it! There is no way around it without doing it the hard way! I have to take a metal post down there with me and a sledge hammer! I hate complications! It weakens the plan. The simpler the better! Thats the best plan! These two Turkey Vultures were chowing down and almost didn’t even notice me. A Immature Baldy flew over and spooked them! They booked it,but not before I got some excellent shots! You can notice in one of the shots a Immature Baldy perched with one of these guys soaring in behind. I was almost to the entrance to the river from Kennedy Lake,when I saw several eagles on the beach to my right! Obviously this got my attention and throttled down. I got my binocs and saw that there were not two but around 10 eagles! (mostly Immature and a few matures) I knew that there must be something dead over there and went to investigate! Yes,there was something dead and that something was a very young Sea Lion! I’m not a expert by any definition,but if I had to take a guess…….I’d say it was a year old or maybe two at the most? I took some shots of the poor creature and saw this strange immature eagle fly over? I thought to myself that it was a bit odd looking for a immature,and than I realized that it was not a eagle,but a Turkey Vulture! We do not get many of those boys up here! I also noticed that the carcass had a opening at the top of the left shoulder. The shoulder blade was exposed and I could see into the chest cavity. I could also see that all of it’s guts were gone! I think the Turkey Vulture had been sticking his head in there and gobbling up the innards? I decided that this would be a good opportunity to set up my Trail camera! I plan on coming back tomorrow and setting the Trail camera up to see who has dropped by for tea with my new dead friend?